Young or old, a funeral is a difficult process. Military and non-military persons have different goals and expectations for end of life matters. As an estate planning attorney, my goal is to educate and inspire a conversation with people and families needing help with end of life matters. 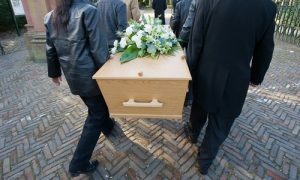 Prior to death, a person can utilize certain documents to assist their family when a death occurs. One of these documents is a funeral directive. Basically, this type of document answers basic questions. For example, selecting a specific ceremony based on our faith, identifying whether we want to be buried whole or cremated and selecting a location for our burial ground. Additionally, you will find articles that address eulogies, military burial ceremonies, creditor claims and related issues and matters. Why are Ft. Snelling Headstones Larger for Some Veterans? Using your next 4 minutes to watch this eulogy for a spouse can be very powerful. I am praying for you and your family.